Ed crossing Piazza San Marco -- the water is from an "acqua alta" the night before -- the piazza flooded with high tide. 2. 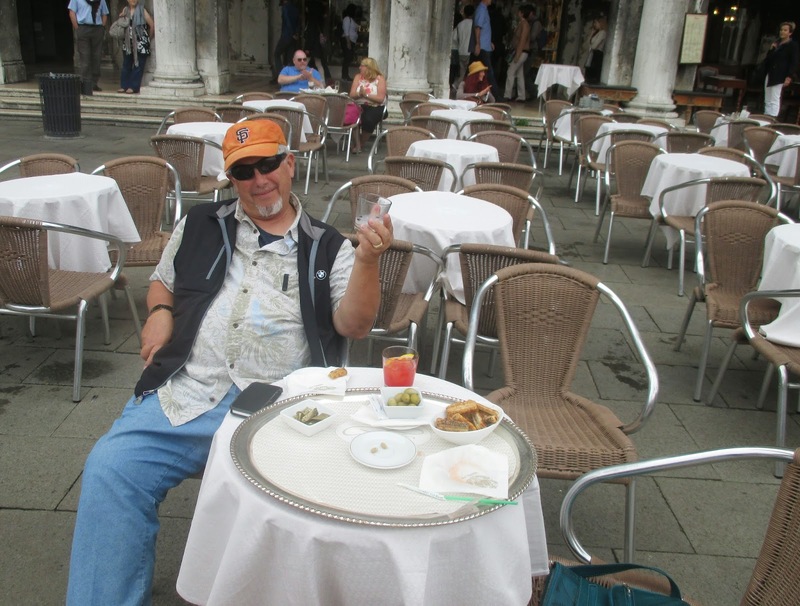 I read on several websites before we left, "try to get away from the Piazza San Marco to see other things in Venice." That seemed kind of puzzling until we got here -- and saw what a dazzling panorama it is. You could spend a very long time there, just seeing the sights in the Piazza area, and most importantly, people watching. The whole world is passing before your eyes. 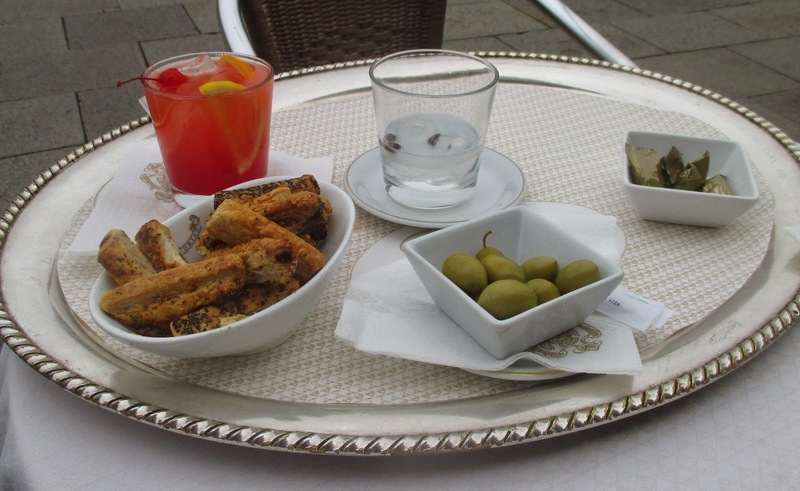 This is what you get for 35.50 Euros at the Caffe Florian in Piazza San Marco. It is totally worth it. 3. "They" also say to be careful not to get ripped off at the cafes in the Piazza -- they have cover charges they might not tell you about, and so on. This is especially true of Il Caffe Florian, a coffee house that has been in continuous use since 1720, and where, according to the websites, you will have the most expensive glass of water or wine of your life. The Caffe was the happy hunting ground of Casanova, because it was the only coffee house at the time that admitted women. Of course, we had to stop there. We had such a wonderful time -- yes, you pay 6.00 Euros per person as a cover charge for the orchestra, and 11.50 Euros for a "Memoires Florian," a small glass of grapefruit and orange juice, with "Sanbitters," but it tastes delicious, and the drinks are accompanied with the nibbles in the picture above -- savory pastry twists, olives, and small candies. The orchestra is wonderful. We loved sitting there for an hour and felt that the pleasure we had in it was worth every penny. 4. The food here, every single bite of it, is incredibly good. Unlike the oversauced, overcheesed American Italian food we're used to, everything is light and fresh-tasting. Portions are extremely reasonable, so you don't feel stuffed. 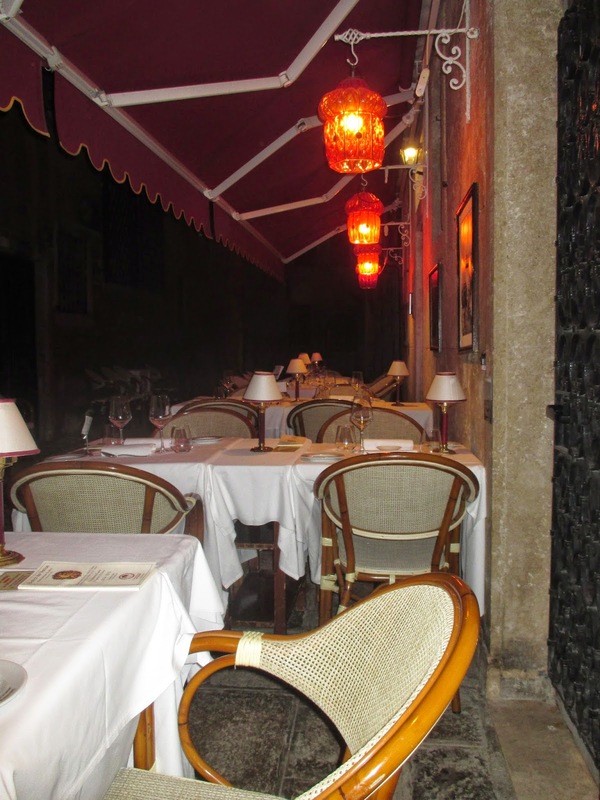 Last night we ate at Bistrot de Venise, where I had made a reservation before we even left California. It was wonderful. We had gnocchi made with eggplant, I had tiger prawns in a tempura batter crusted with almonds and with a delicious dipping sauce (not made of soy sauce), and Ed had a 16th century recipe dish of pasta with goose, bacon, and I don't know what else. It was so complex and earthy and wonderful. And we tried real Italian tiramisu for dessert. Don't even get me started on that. And then they threw in an amuse-bouche to start, a tiny piece of chocolate cake as a "pre-dessert," and little cookies at the very end. It was unforgettable. 5. 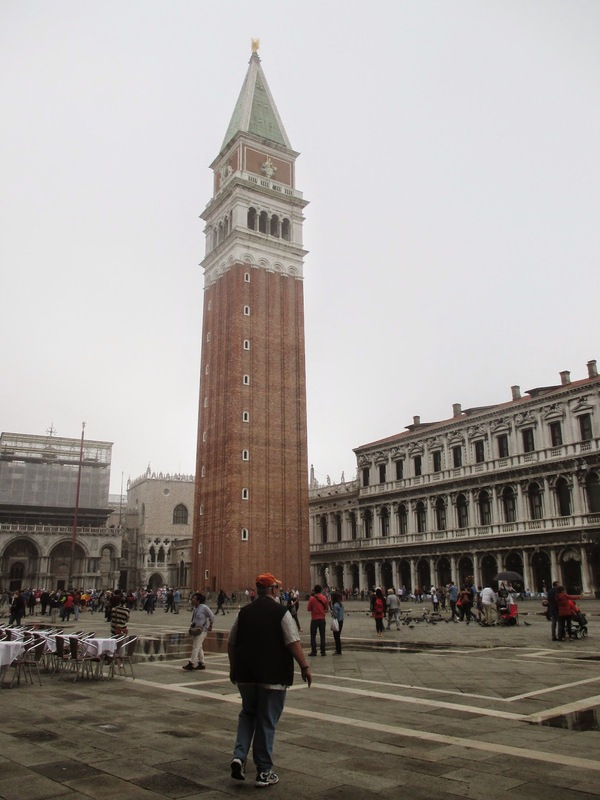 If you're above a certain age and not in the best of shape, the reality is that Venice is a challenge. The streets look very small and short on the maps, but they're longer than they look, and every five minutes you have to go over a bridge. And over a bridge. And over a bridge. Somehow I hurt my back on the way here, wrestling with a big suitcase and a heavy carryon, no doubt, and it's been a bit of a struggle. When people say, "Oh, it's a two minute . . . five minute . . . seven minute walk," we just laugh, now, since we'll probably have to stop several times to flatten my back against a wall for a minute, or to just catch our breath. Getting in and out of boats is a real challenge -- when we left the airport, I got into the water taxi with no problem, but of course I humiliated myself getting out of it -- the boat was moving up and down, the dock was moving up and down, they were not in sync, and just as I tried to step up, the boat and dock went in opposite directions, and I fell in front of a bazillion people waiting for a taxi on the shore. Out loud, I was saying, "I'm fine, I'm fine," and inside, I was saying, "I will never see a single one of these people again in my life," and we tried to walk away with as much dignity as possible. So am I sorry we put Venice on our itinerary? Hell no, I wouldn't have missed it for the world, no matter how much of a struggle it is; I've seen many people with more challenges than I have managing to get around. We have absolutely no schedule, nowhere to be at any particular time, so we just do the "senior stroll," and eventually we get to wherever we want to be. It's late, so I'll close for the night. Look for more random thoughts tomorrow. I want to go, too! It sounds like you are having a lovely time... (minus the fall). I hope you continue to enjoy your trip!